For 19-year-old Fraser Crossan working in the engineering industry is the pathway to his dream career. A fitting and machining apprentice at Stafford Engineering Ltd in Hamilton, Fraser has always known what he’s wanted to do – to be a race car engineer – and knocking on doors is making that dream a reality. “I’ve known I’ve wanted to work in this industry since I was two,” Fraser says. Fraser is almost half way through his apprenticeship, but initially started off doing an engineering course at the Waikato Institute of Technology (Wintec). 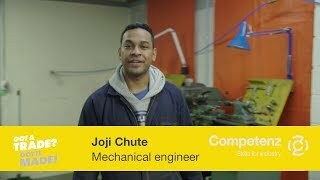 “I was at Wintec doing the NZDE (New Zealand Diploma in Engineering) and I wanted part-time work so I went door-knocking. I ended up talking to Kaleb James (Stafford Engineering Ltd General Manager) and got a job working part-time after classes just to get some experience,” he says. Hoping to finish his apprenticeship by the end of 2016, Fraser has learnt accuracy is key. “My accuracy has gone through the roof. I never thought I was rough at doing things but I was. I’ve learnt to be accurate with my work as well as lots of hands-on skills and specific details on machinery,” he says. The team at Stafford Engineering have been supportive of Fraser every step of the way. “Stafford Engineering is awesome; they look after me. There’s nobody in the team who doesn’t want to help. The senior team are really good at making sure everyone knows what they’re doing,” he says. Kaleb James says Fraser is hard working and has high standards. “His practical background has been beneficial through his apprenticeship,” Kaleb says. Fraser’s advice to young people wanting to step into the workforce? Be proactive and approach businesses. “Go door-knocking. My mum nagged at me for a month before I started to knock on doors. I just walked in off the street,” Fraser says.